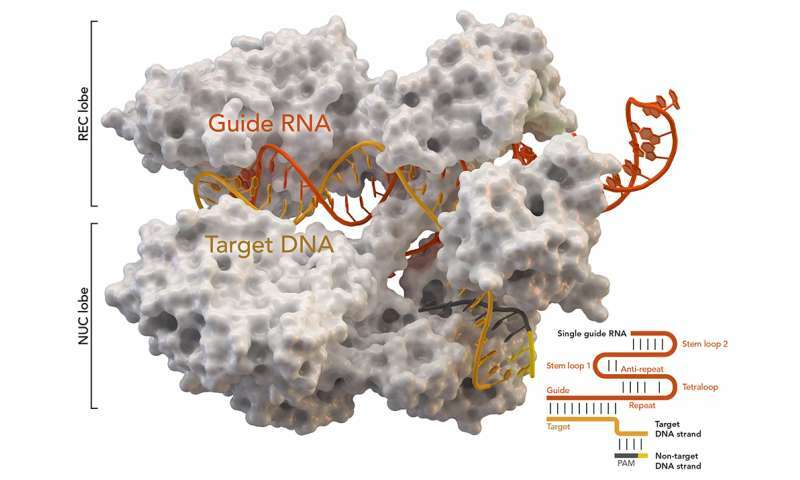 Scientists at UMass Medical School have developed a strategy for editing and repairing a particular type of genetic mutation associated with microduplications using CRISPR-Cas9 and a seldom-used DNA repair pathway. Described in Nature, this approach to programmable gene editing overcomes prior inefficiencies in gene correction. "It's like hitting the reset button," said Scot A. Wolfe, Ph.D., professor of molecular, cell & cancer biology. "We don't have to add any corrective genetic material, instead the cell stitches the DNA back together minus the duplication. It's a shortcut for gene correction with potential therapeutic appeal." Dr. Wolfe, a co-investigator of the Nature study, is an expert in CRISPR-Cas9 and other programmable nuclease-based methods of gene editing. Most of these techniques require both generating a break of the DNA strands at the defective gene and the introduction of corrective genetic material. The new sequence is inserted into the break and repaired by an innate DNA repair mechanism found in cells known as the homology-directed repair pathway. Though therapeutically promising, this method of correcting genes can be inefficient and has other technical challenges. Wolfe and co-investigator Charles P Emerson Jr., Ph.D., professor of neurology, director of the Wellstone Muscular Dystrophy Center at UMass Medical School, and an expert in skeletal muscle development and muscular dystrophies, believed that there might be a more direct approach to correct diseases caused by microduplications. They reasoned that if the microhomology-mediated end joining (MMEJ) pathway could be effectively harnessed, instead of the homology-directed repair pathway, it would remove the duplicated sequence and restore the gene's functional sequence. Less efficient and rarer than other cellular repair mechanisms, the MMEJ pathway often results in deletions on either side of the break and is responsible for performing a small percentage of DNA repairs – less than 10 percent according to some estimates. Dr. Emerson had a promising disease target for evaluating the feasibility of this editing approach – limb-girdle muscular dystrophy type 2G (LGMD2G) caused by a microduplication in the TCAP gene. The Emerson and Wolfe labs treated pluripotent stem cells generated from a LGMD2G patient with a Strepetococcus pyogenesCas9 (SpCas9) nuclease to target a DNA break near the center of the microduplication in the TCAPgene. As they predicted, the MMEJ repair mechanism deleted one copy of the microduplication – effectively stitching the DNA back together again with remarkably high efficiency, leaving out the mutated genetic material and restoring the gene to enable normal TCAPprotein to be produced. How many diseases are caused by microduplications that might be treated by MMEJ nuclease gene editing? Collaborating with Christian Mueller, Ph.D., associate professor of pediatrics, the team demonstrated that microduplications in the HPS1gene associated with Hermanksy-Pudlak syndrome type 1 could be corrected in patient cells. Oliver King, Ph.D., assistant professor of neurology, then developed computational tools to search human genome databases and remarkably identified 143 diseases associated microduplications that would be treatable using their Cas9-MMEJ approach.